Ten years is a long time in the games business. Back then, online games made with Flash sustained thousands of small indie game developers. Games on Facebook were massive and helped build companies like Zynga and PlayFish. Slowly, old and clunky feature phones were replaced with iPhones and Android phones. The PlayStation 3 and Xbox 360 fought in the console space, whilst the Nintendo Wii delighted people of every age and gender. 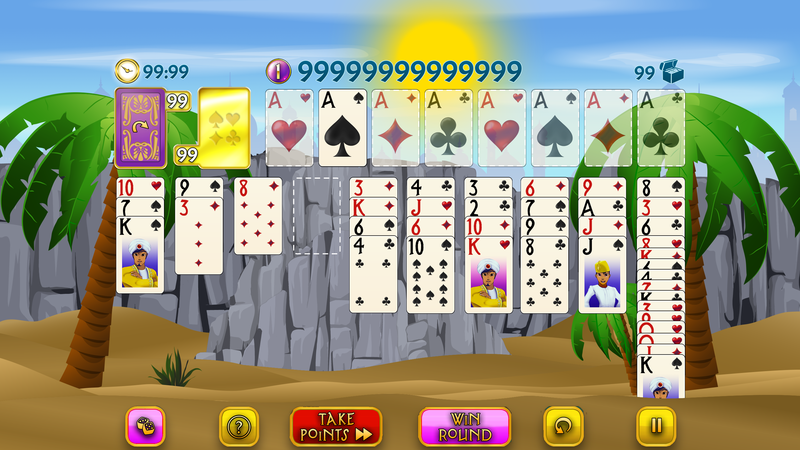 This was the time in which Magic Towers Solitaire was born. It was actually the third game we had ever created and was designed to help tick us over whilst we worked on our mega downloadable PC games. 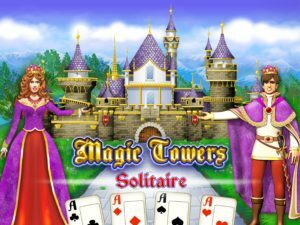 The first two games before Magic Towers Solitaire are now defunct and the PC games turned out to be a venture never to take off, but Magic Towers Solitaire is a survivor, and not for any old reason. 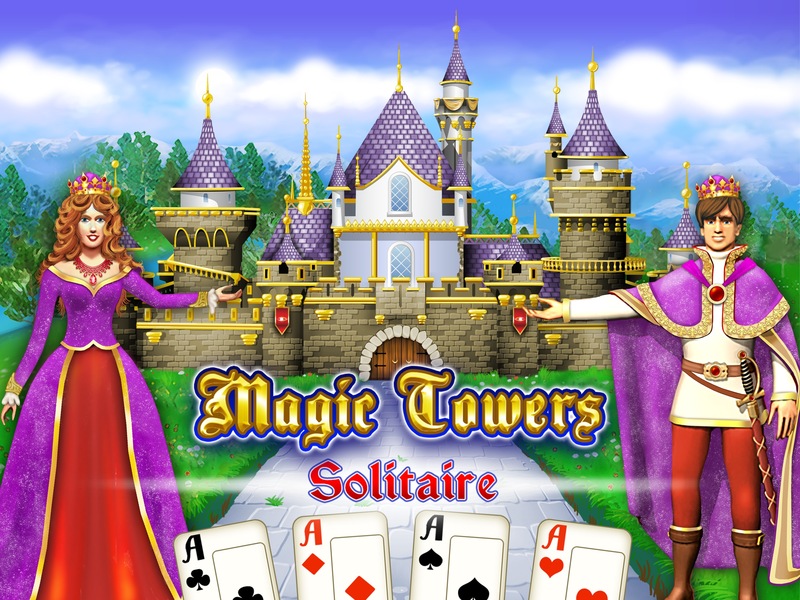 Magic Towers Solitaire has a devoted fanbase, history behind it and is one of the founding stones on which we expanded our company. There are so many stories to tell from Glowing Eye Games but here are some lessons for all you indie developers to help you along the way to creating and sustaining your game and business. Class, take your seats! Full of beans about our new game, we hired a small contractor in the Crimea to make it. All was well at first, until the graphics came back to us. In retrospect, our art brief was poor, so at first it looked like a childish game, which was not what we wanted. This mistake was on us and one which we had to pay for – not a great sum, but the mistake was memorable. We went back to the developer and asked for changes. Although at first the air was a little tense, we managed to collaborate and discuss terms to make something better. Always remember, if you’re paying for a service, don’t let emotion or mistakes stop you from starting something again. There’s no shame in admitting you were wrong. Even the best of us want to blame others for our mistakes, especially when working with outside sources. Take responsibility and you’ll get the results you want quicker. Likewise, if your contractor doesn’t take responsibility for their side, reconsider them. 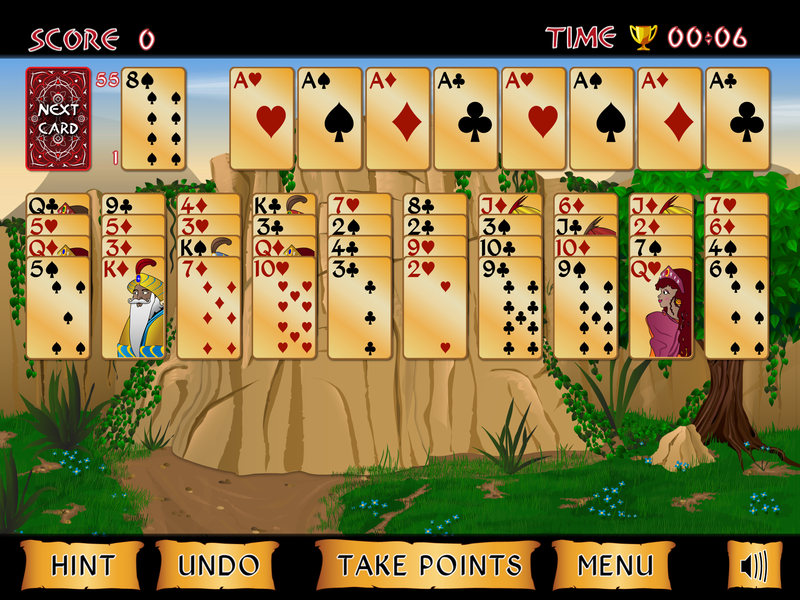 When we first released Magic Towers, it was called Tri Towers Solitaire. OMG this was a massive mistake! Little did we know, it was already a registered trademark, so, out of the blue, we received some pretty threatening letters from the owner’s lawyers. What followed was a lotof paperwork, a lotof money and a lotof time getting our renamed game updated on the thousands of small websites on which it was hosted. This was a bad burn, especially considering we could barely afford to pay wages at the time. So, don’t go in blind, do your US trademark research! This is much easier than been hounded by lawyers. (Honestly, they’re good at sending the dogs after you!). Friendly competitors are worth having. Treat them well and if they’re decent they’ll do the same. Despite the frightening lawsuit, we weren’t completely down on our luck. Our previous sponsor, Jochen of Smiley Games, told us about Mindjolt, an exceptionally popular games service on Facebook at the time. Without Jochen’s tip-off, our company may not have survived the year. 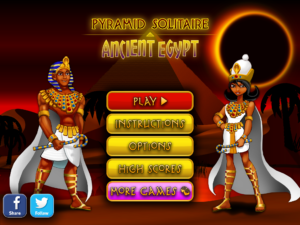 Magic Towers Solitaire became one of Mindjolt’s most popular games and even led to the creation of Pyramid Solitaire: Ancient Egypt, which is still one of our greatest successes. Jochen is now doing brilliant mobile Match 3 games and we have a good connection to this day. Lesson 4: Maximize your distribution and platform coverage. Back in the day, online indie games were mostly supported by other gaming websites. 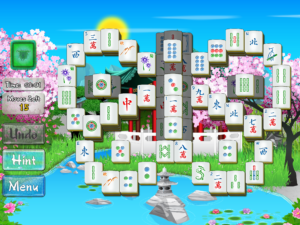 We’d noticed and been a part of clustering around the benefits of Facebook games, but there was still room for growth. 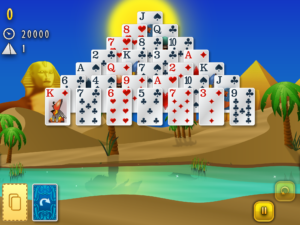 We set up Solitaire Paradise, a website for all kinds of card games, which hosted our own and others’ games. This helped bring in revenue and promote our products. Additionally, there were websites that wanted games with their branding. We made nine deals here on Magic Towers alone, mostly easy jobs that brought in more revenue. Nowadays, you can advertise and implant your game on so many app and console stores, so never pen yourself in to one sector. There are so many more options, so take your time to investigate! Remember Jochen from lesson 3? Well, during our time as friendly competitors, we helped each other out with some cross promotion. Cross promotion is always worth doing between your own games, especially if you have a house style. Cross promotion with friendly developers is rarer, but if there is an overlap, you know players will move on sometime. So why not to someone who can send some new players back to you? This way, you can expand your audience, rather than having to source new customers every time you release another game. Done well, you could have a long queue of them ready for you on the release date. We also promoted across platforms. Starting off with online PC games, we branched into the iPhone with a little help from a good university friend and royalty deal we could all trust and work with. We were always bug fixing, enhancing and updating. After some time, we had some small triumphs. Our game got featured by Apple in their category lists and was the number 1 card game in Uzbekistan. I still like saying that, it did well elsewhere too, but Uzbekistan is just a great sounding name for a country! Thank you for your custom. Please come again! As mentioned in the above paragraph, there are lots of thing to mull over and improve. Most of the time, you’re not doing it to be fancy, it’s just things that makes it better for the customer. Make fonts more readable, port to Android or iPhone, clarify graphics and simplify instructions; these are all often well-received and keep players satisfied. So, no need to rest on your laurels once you’ve completed the game, you’ve got to tend that garden and get rid of the weeds! Change is scary, but an old game can learn new tricks. 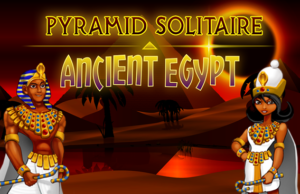 Whilst Magic Towers Solitaire was ticking over, we decided to update Pyramid Solitaire: Ancient Egypt with new technology. We changed the timing of how the game was played and changed the graphics significantly, so that we were deluged with angry customer emails. We always take customer feedback to our heart, so we quickly went about doing a lot of fixes and alterations. Some of our changes were for the best and went unchanged, but the end result was that we lost a few customers. 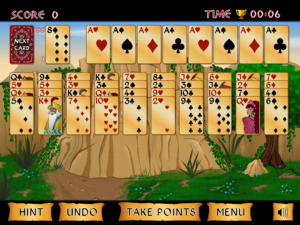 So, with Magic Towers Solitaire, we learnt our lesson and were far more cautious. Changes were gradual and What’s New updates helped keep the customer informed and prepared. Happily, the players kept playing! The transition was as smooth as a scoop of the finest, organic ice-cream (vegan option available). Lesson 8: Always keep improving! For complete disclosure it’s worth saying Magic Towers could do with some sprucing, so let’s take lesson 7 and make it a practical one! Which of these updates should we do? – a veritable boat-load of little tune-ups. We’ll pick one or two of these with each update, just to keep the old fanbase satisfied while making it better for new players. You see how this business works? Always maintain, update, keep it brand-spanking, sparkly new and it will seem that way to the customer, and maybe Magic Towers Solitaire will continue to bring joy and relaxation to players for another ten years! As a small indie games developer, business mistakes can be deeply painful. 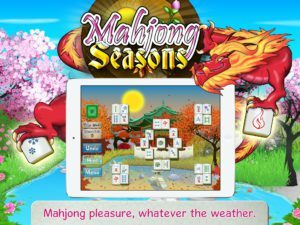 Here we share our biggest mistake with the game Mahjong Seasons. We wanted it to be beautiful, brilliant and big. We wanted it to be perfect! 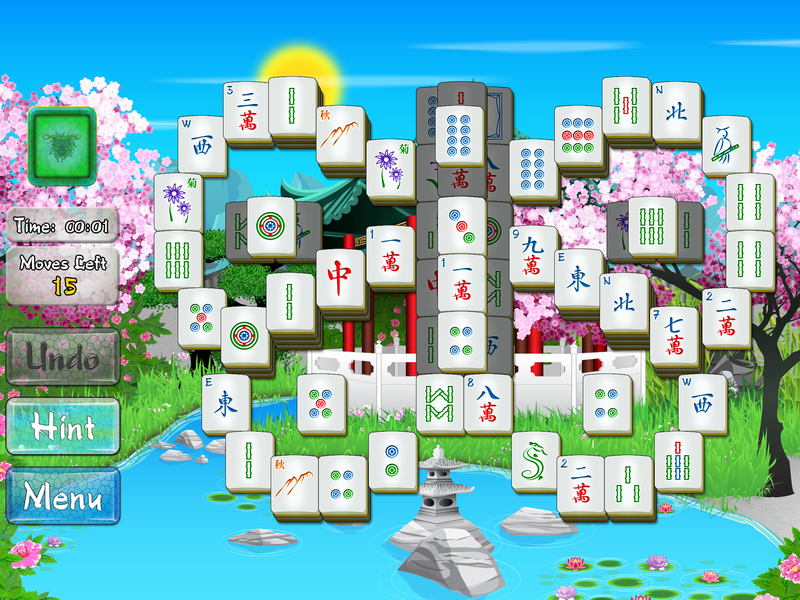 We threw time, effort and money at creating the best Mahjong game out there to try and be the PopCap of Mahjong. 2014 was a heady time for the tech industry, which thought tablets would rule the world and replace PCs. It was also the year we released Mahjong Seasons. We loved the form factor. We knew our games were best experienced on the iPad (this was back when we only supported iOS). We wouldn’t compromise on quality and make a weaker mobile version; it was to be iPad only. The decision alone meant that it was unavailable to the huge number of potential iPhone players. Worse still, mobile phones got bigger and better, making our decision to ignore their furtherment short sighted. Tablets are still important as great consumer devices, but they didn’t and won’t take over the world. Our perfectionist attitude to the game’s development meant we had massive, long-winded debates over things like the level select. That bloody level select! We developed a massively time-consuming streaming code, which would allow players to scroll through levels. This was visually redesigned several times. Heck, even the way a player scrolled through the levels was debated and refined a multitude of times. And you know what? It didn’t matter. We put so much focus on this area that we increased the development time by months! We should’ve gone with a simpler design, knowing now that most players really wouldn’t have minded. No one in the company voiced that we should be spending our time on other things, we just had to do it right. The mistakes don’t end here. We created a poor combination of revenue generation with a badly thought-out balance of advertising and purchased level packs. Instead of maximising revenue per player, we reduced it. We could have a created a game that had randomly selected levels that would be played more often, but our problem was that our game was level based. This limited the amount of time any player would take enjoying the game, reducing the advertising revenue. In fact, this business model, married with our design, conspired to create a game where we ended up with an average revenue per player of $0.22. This is worst revenue per player from any of our games. The artwork was redone several times. We created beautiful effects as the player enjoyed the game, delicate animations and delightful particle effects, all of which required a significant amount of coding. Each little item stacked up: the time, cost and debates on whether it was good enough. Each tweak and rework eventually sapped the morale of the team. The hope was that the advertising would get it noticed and give it traction. The reality was that, after the advertising campaign, it became one of the least downloaded games we have ever made. But we weren’t even done there. We knew the game would never make any money, that the amount of people finding it and enjoying it would be miniscule. But out of pride and loyalty to the few players we had, we made one more level pack. Something for the tiny number of loyal players. It was a nice thing to do for players, if not a little delusional, benefiting maybe a few hundred of them, but it increased the cost of making the game upward again. Really, why? Why spend another penny on something that had so obviously been ignored by the casual gaming public? In retrospect there was no proper business-minded justification for this extra effort, only a desire to be a supportive game developer who really valued their loyal players. The game failed to make back even 5% of its developing and marketing cost, and everyone’s confidence plummeted. After a year, this was the final nail in the coffin and it was hard to face. After its one update, we let it stay on the App Store, picking up the occasional download in the hope it would quietly accrue the final few cents of revenue. By 2017, it was taken unceremoniously off the App Store. I wish I could say there was an upside in going through this project, but much of it was heartache and headache. We learned from our mistakes and developed some technology, although we didn’t reuse most of it. We lost so much time doing it that it’s horrible to write about even to this day. But why should you make the same mistakes we did? Here’s our take home advice to avoid this kind of wasted effort. Don’t overdesign and over scope your game. We should have limited our main efforts to the actual playing experience rather than elements, like the level select screen. Know when to give in. When a game looks like it won’t bring you any additional revenue, that is the time to cut your loyalty to your players. Our efforts to bring an additional level pack lost additional money and time for us. Think about your business model. An advertising-based game thrives on re-playability. A game with in game level purchases thrives on people wanting new content. Our game failed on both counts by incorrectly combining both. Support as many platforms as is feasible. Our mistake was supporting tablet only. We should’ve made it compatible with mobile phones, even if that reduced player enjoyment a little. Advertising. Advertising can give a game traction, but if it looks like it is failing even with a solid advertising campaign then it’s time to cut it off. As a professional game developer, you must accept the game you create isn’t the finished article and never will be! Audience tastes change, your team develops, technology moves on, and we grow. The first version of a game tests the water, and subsequent versions build upon that, until you have a game closest to your audience and your current ideal. Perfection is not a destination, but the pursuit of it is worth the challenge. 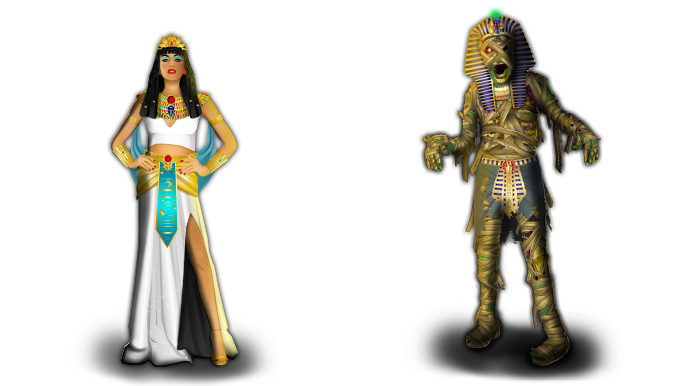 A perfect example of this is the revamping of our characters in Pyramid Solitaire: Mummy’s Curse, Cleopatra and The Mummy. Visuals are paramount to enticing a customer. Even a catchy name or an eloquent description won’t grab them as quickly as an image will. When you only have someone’s attention for a short time, even if it’s just as a second as they scroll past, they must desire what they see. Those images are the hook in your customers’ hearts. The first design of Cleopatra and her deceased compatriot, The Mummy, were detailed and extravagant, with rich colours and intense expressions. 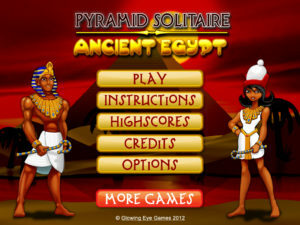 Our version of Pyramid Solitaire, however, is meant to be relaxing and approachable. 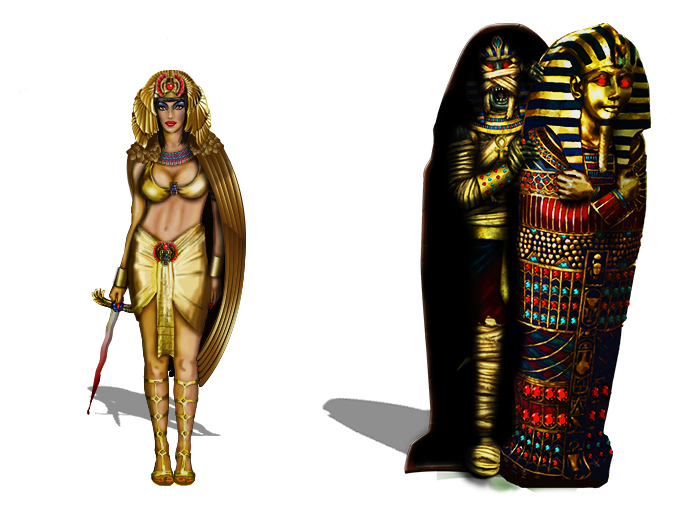 An overtly sexualised Cleopatra did not suit the game as a whole, although we did have a few queries when we changed it! The Mummy could barely be seen in his sarcophagus, which made his character insignificant. The second variation made these characters cute and cartoonish. Cleopatra bore a friendly smile and The Mummy was made to be delightfully goofy, with knobbly knees and simple posing. Although more approachable, they missed our audience again. These seemed better for children, whereas our target are adults. Although children are sometimes introduced to our games by their grandparents or parents, the majority of our downloaders are adults and it makes sense to focus on one audience rather than multiples. The third iteration merges the detail of the first design with the approachability of the second. Cleopatra, clad in white, has a far more individual and assertive personality, which is in keeping with her status as pharaoh. The Mummy has taken elements of classic horror, maintaining details which make him seem intriguing and eerie. 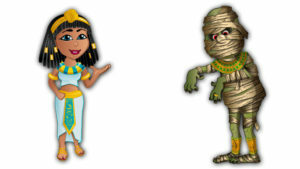 As a pair, Cleopatra and The Mummy give character to the game, allowing the customer to fully connect before they know all the details. They evoke a sense of wonder, achievement and intrigue, and that is all before the game has begun. As well as readdressing our characters, we regularly update our game graphics and functions to keep the experience as fluid as possible. That way our best work is always out there. Although this is a small example for one of our games, we use the same thinking to improve and upgrade all our games over time. Everything changes; there is always room for improvement, and our solitaire games can benefit from this idea. Here at Glowing Eye games we do constant tweaks and improvements to our games so our fans and players get the best experience that we possibly can make. We have to, because the genre of solitaire is so full and making our games better is probably why we are still in around after 8 years! 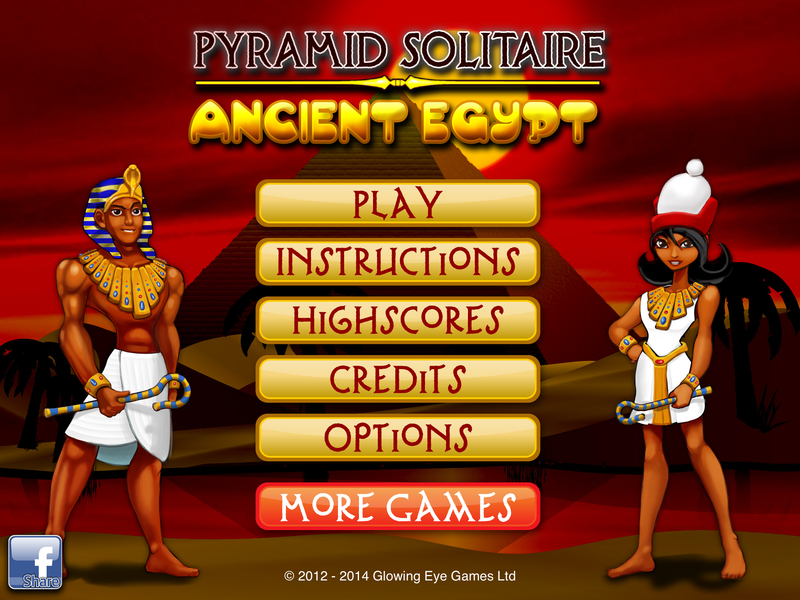 A few months ago we released our remake of Pyramid Solitaire Ancient Egypt. What prompted us to completely rewrite our work was that the original code was getting so hard to maintain. Naturally, doing a remake meant we wanted to keep all the things our fans love while adding enhancements that people enjoy. Any game developers might think that such a project is relatively easy, but we found that there was a lot of effort required. So what has changed and, more importantly, why? Our original artwork was good, but we had a think about how we could take it even further. The original graphics started life in our simpler, online version using a tiny resolution before being scaled up for iPhones and iPads. Of course even those resolutions are now dated and we had to support the beautiful screens that modern devices display. We enhanced the detail in the background, created the eye catching eclipse and updated our characters with beautiful new outfits. We wanted the game to feel friendly and sumptuous. From a technical point of view, our biggest change was our game engine. 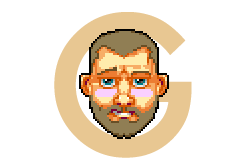 Our lead programmer, Gregg, created a 2D engine based on the OpenGL. This allowed us to easily add beautiful particle effects that adorn Pyramid Solitaire Ancient Egypt and our other games, as well as making future updates easier with the continually changing iOS tech. The final thing we did was review the game and scoring mechanics, fine tuning them to make the whole game feel slicker and better in general. We didn’t quite nail this the first time, and we got a massive amount of feedback from our players! We always put a great emphasis on the smoothness of the game, including how cards move and the timings they have while playing. We tried to match what we had previously but we made a few mistakes, and the players noticed and told us where we went wrong!!! As a team we were never sure how important those kind of things really were so it was an excellent learning experience before we fixed and improved everything so it felt awesome! Our score tweaks also caused some issues, but after a round of improving the range of bonus scoring options we found our players were very happy with how everything worked. We are exceptionally lucky to have some very devoted fans who contacted us directly to give their opinions. 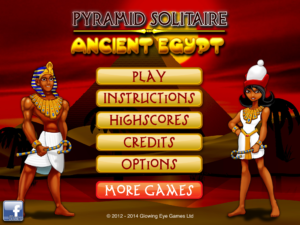 But there is one thing we discovered while making our luxurious version of Pyramid Solitaire Ancient Egypt; whatever theme we make, some people just want to play on a classic velvet green background. They find the theme distracting, and there is nothing that can change that. So the team talked. For us, making the themed versions of these games allows us to express ourselves creatively and to create eye catching card games in a genre where so many others would benefit from crafting the experience. But like it or not, most players would never even consider the themed version because they wanted something familiar. 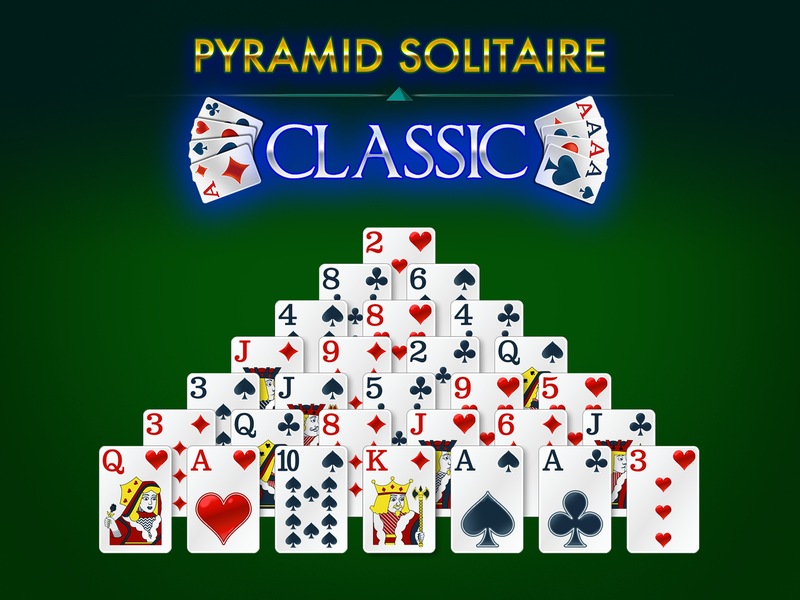 We feel it’s important to listen to the players, even though the setting was less artistically interesting for us, we decided to try and make the traditional version of pyramid solitaire available on the iPhone or iPad. We kept the gratifying smoothness of our game, maintained the scoring system that lets you play strategically and wrapped it up in the best casino theme that we possibly could. For this production we made it our mission to create the best classic pyramid solitaire game around. 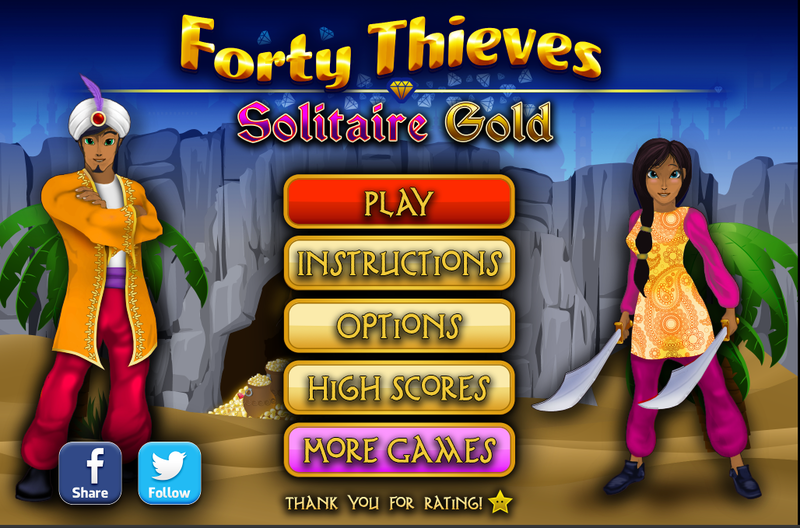 We think it’s gone well and we’re proud of what we’ve made, and now we trust that solitaire players will agree! I’m happy to say that our new website is running smoothly, feeling great, and is a huge improvement on what we had previously. However, there has been a change in how to play our games from the website; it’s still super easy, just a little different to how it was before. Here at Glowing Eye Games we’re a small company of only ten people, quietly confident in the fun games we make. With eight years under our belt we’ve become a well-oiled machine; a great team who are dedicated to producing games of the highest quality that you can enjoy. Even before the introduction of the iPhone and App Store our dear leader J, Mark, was already working on mobile games. He worked with the talented team at Glu Mobile – recently famous for the ridiculously popular Kim Kardashian game – but after a few years it was time to break. With a tiny loan he set out and created Glowing Eye Games, although at the start it was all about online games. Initially there were a few experiments. The first was Star Crash, a simple game made on a shoe string budget. The aim of Star Crash was simply to test the process and the market allowing Mark to start on much more ambitious projects. Some of these never saw the light of day, but from each one he learned something new. 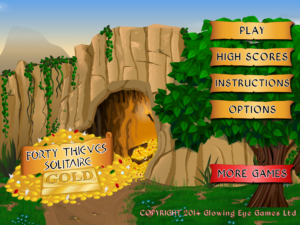 After a few trials Glowing Eye Games finally developed its first big success in Magic Towers Solitaire, which is still one of our most popular games today. Interestingly Magic Towers was created purely as a smaller game while working on other projects. It’s success and the reaction from players was a pleasant surprise. It showed there was this untapped niche in simple card games that had been unexplored. 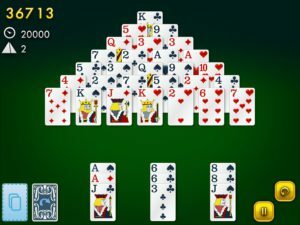 I mean, you can get standard versions of solitaire on your computer, but you have to admit they can be a bit bland. Glowing Eye Game saw the potential in making these games fun and appealing again, with lots of bright colours, friendly characters and making them smooth, slick and easy to use. Glowing Eye Games’ had found its niche. 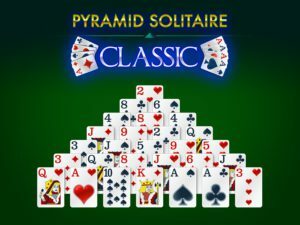 With this minor triumph came the launch of Solitaire Paradise – a website that still has our games today (solitaireparadise.com if you’re interested wink). 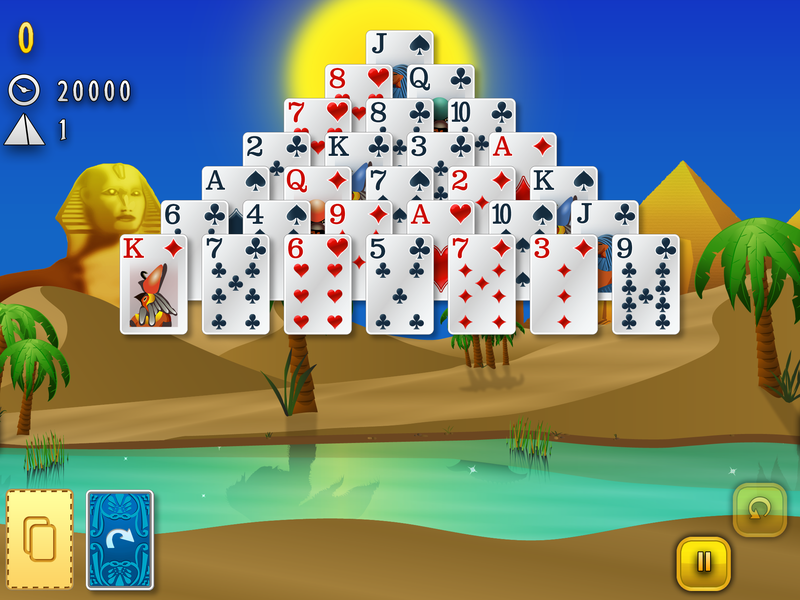 With the release of Pyramid Solitaire Ancient Egypt, the number of players continued to increase and the work soon became too much for one person. Although Mark had worked with freelance programmers and artists in the past, Glowing Eye Games needed its own team to create the quantity and quality of games that the players wanted. With that in mind Mark approached Chris – an old friend and gifted programmer – Katie, Chris’ wife, who happened to be a talented artist and quickly taught herself in magical craft of Photoshop and Illustrator. Shortly after it was clear that a producer was needed. Which is where Max bursts through the door. Well actually he is impeccably well mannered, so he knocked! German, born and bred, Max took his first steps in the game industry at Sega (armed with an incredibly relevant English Literature degree). Starting out as a language tester, friendship and talent blossomed into an opportunity in producing. With major successes like Sonic Jump, Max became a rock-solid producer but due to company instability decided that going freelance would be a better option. Of course as Glowing Eye Games’ work load grew Max was happy to settle down and bring his talents permanently to the team. Around the time of Max’s hire, Kawe also joined the team. 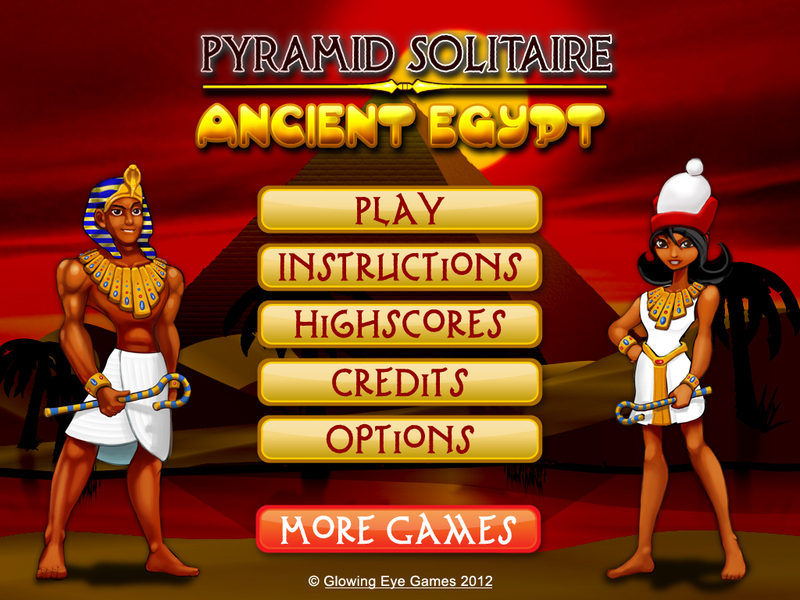 As a friend from Mark’s Glu days he fit right in, and he previously created the artwork for Pyramid Solitaire – Ancient Egypt. He brought Gregg on board and now they’ve become lead artist and head of development respectively. At this point Glowing Eye Games had branched out and was experimenting with domino games, namely Mexican Train Dominoes Gold, which is still steaming along today. In the next couple of years our team expanded once again with the hire of Alessio, a programmer, Stephanie, our games tester, and David our associate producer. Like Mark and Max, David pre-dates the app store (his words, not mine!) and has spent years in the games industry. Working as a games tester with the giant EA, he went the same route as Max and became a producer. He worked on some great games, including the smash hits Burn Out and Cranium, but felt that his time with the games industry had come to a close. That was until he heard the strong call of Glowing Eye Games and couldn’t resist jumping straight back in. As an associate producer he’s in charge of localisation, translating our games so they can be played across the world and managing the testing process. Finally of course there is me, Jasmine. I’m rather new here, only three weeks in and clearly hired because of my witty quips and unrelenting optimism (or maybe Mark just needed someone to manage the social media… See what I mean about the optimism?). Either way, they’ve let me loose in the blog section and you’ll be hearing a lot more from me! Now that you know all the ins and outs of our past and our team, I’m sure that your dying to know what we’ve been working on recently. Our games have been on the App store for a long time, and we’ve built quite a following. We’ve been so focused on other projects that we haven’t had the time to update them yet. But recently we’ve decided to take the plunge. Currently we’re in the process of modernising them to get the most of out of the iPhones and iPads you enjoy them on. We’ve been rebuilding them so they are easier to update, more beautiful and even more fun. Right now we are working on Golf Solitaire Pro and Pyramid Solitaire – Ancient Egypt. As you can see the original style remains, but we’ve got better fonts, the background is stronger and the outfits have gone through a complete makeover! And we are also working on one of Katie’s earliest games, Forty Thieves Solitaire Gold. With all the experience she has racked up over the years we felt that we could make it even more enticing and playable. You may be familiar with these screenshots. We’re still pretty proud of the artwork for Forty Thieves, but considering that it’s one of our earlier games it’s due for an update. We’ve also given the backgrounds and once over too! And a big change we made is to the cards, now on a white background and a better font they’re much easier to read. I think that just about brings us to the end of the post. Thanks for playing our games, and please continue to give us such great reviews, we really, really appreciate it. That’s all for now, speak to you next time! Hello and welcome! Whether you’ve been with us since the beginning or you’ve recently joined us, you’ve probably noticed that our website was a little outdated, a little clunky and in desperate need of a makeover. For the past few months we’ve been doing just that. Our web address remains the same but we’ve propelled ourselves into the modern world. It’s not only prettier, but it’s faster and so much easier to use. The layout is simplified and you can easily get to the pages you want, and everything is in its appropriate area. We’ve also added a couple of extra pages in our renovation (including the piece de resistance that is this blog page…) to let you in on the ongoing adventures within Glowing Eye Games. And huge thank you and round of applause to our friends at ONI Design for making all of this possible. But the website isn’t the only thing that’s been updated. We’re currently in the process of updating all our games, to make them slicker, shinier, and better all-round. The updates are due to take effect in the coming months, so 2016 is an exciting year for us. We will be letting you know when these updates happen, along with what changes have been made when the time comes. That’s all for now – stay tuned for more here at Glowing Eye Games!